Excel Financial Investment Tools (MarketXLS) is a suite of add-in tools to assist with decision making for investing in financial markets. The solution combines separate modules for downloading live and historical stock data, performing advanced analysis with visualizations and screening opportunities via fundamentals analysis. Additional investment tracking portfolio management tools make the Excel add-ins a complete solution for financial investment research and management. 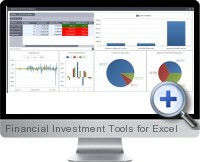 Stock Functions - Over 150 Excel functions to return fast live quote data for equity stocks, currencies and mutual funds. Quotes are reliable and can be refreshed automatically at time intervals. Historical Data - Import end of day and minute US stock data since 1996 from NYSE, NASDAQ, AMEX and ARCA exchanges. Raw or dividend and split adjusted data for Open, High, Low, Close and Volume with ability to update from reliable sources. Technical Analysis - Over 120 technical indicators grouped by category and ability to customize and group for cascading signal trading strategies. Pattern scanning technology highlights opportunities for potential long and short position taking. Data Visualization - Charting specifically designed for stock data analysis with ability to zoom in and out and annotations for pattern detection. Interactive financial charts can be customized and exported into multiple formats. Stock Screening - Over 80 fundamentals and ratio metrics for up to 10 years can be combined with customized conditional criteria for screening stocks. Screening criteria can be saved and visualized in either text or decision tree format. Portfolio Management - manage and optimize financial investment portfolios by importing trading transaction data. Performance and risk reporting accounts for commissions and tax with professional visualization and interactive pivot viewing features. Analytical Tools - additional investment and research utilities include financial news feeds, chain option pricing, dividend history and market mover analysis.